SANCHI (RAISEN): Leaders of different faiths on Tuesday resolved to extend maximum possible support to newborn care and immunisation initiatives with an aim to bring down infant mortality rate in Madhya Pradesh. The unanimous resolve came following a fruitful discussion on importance of newborn and maternal health care and especially immunisation for bringing up healthy and nourished future generation. 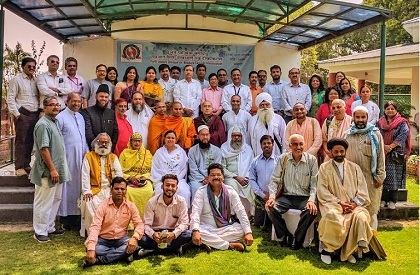 About 50 leaders had gathered at Sanchi on May 2 as part of ‘faith leaders’ dialogue on newborn care and immunisation’ organised by Bhopal-based NGO Spandan with support of UNICEF, MP. The objective was to enlist support of the faith leaders to reduce neonatal mortality. The leaders representing faiths and sects of major religions like Hindu, Muslim, Sikh, Christian, Buddhist and Jain agreed that newborn and maternal health care, as well as full immunisation, was of utmost importance to ensure healthy growth of babies and to prevent infant deaths. They also agreed that the religious/faith platforms could be used to effectively communicate this message to the followers of respective communities. At conclusion they signed the resolution to extend maximum possible support to the government and supporting organisations’ initiatives in this respect. Brahmakumari Reena, MS John of Methodist Church, Vipin Jain, who represented Jain community and Father Shaji of Archdiocese of Bhopal. At the outset, principal secretary of health department, Gauri Singh outlined the current scenario on newborn and maternal health. She said that the facilities and services of the health department were in place, but the connection of the community was missing. She said that since the faith leaders had large following and people took their guidance seriously, they should come forward and propagate messages of ideal breastfeeding practices (within first hour and exclusively for six months), completion of immunisation cycle of two years and special care of per-term/low birth and malnourished babies. Manish Mathur, Officer In Charge, UNICEF, Madhya Pradesh shared that in Madhya Pradesh, 1, 16, 820 children die before their 5th birthday, out of these, 64,063 new-borns die within one month of their life and these infants could be saved through proper interventions. These include warmth, cleanliness, early initiation and exclusive breastfeeding, protection of new born and immunization. Faith leaders’ support could make the achievement of the objective to reduce neonatal and childhood mortality easier. Mital Sanket Shah, Health Officer UNICEF, Madhya Pradesh responded to the queries and spoke on the importance of early care of the new born. Dr Sarita Verma and Dr Ashwin Bhagwat of state health department made presentations on newborn care and immunisation respectively. Anil Soumitra of Spandan briefed about the objectives and the purpose of the meet. Anil Gulati, Communication Specialist UNICEF, Madhya Pradesh spoke on possibility of setting up of platform of faith based leaders for children which can take the momentum forward. Senior journalist Girish Upadhayay coordinated the dialogue.